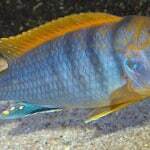 Compatibility: Other Lake Malawi cichlids. 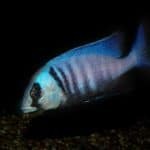 Feeding: Omnivorous – Does well with flakes and pellets designed for african cichlids. Diet should be supplimented with green vegetables such as romaine lettuce, spinach, peas or zucchini. Sexing: Females and juveniles are yellowish-orange. Males are black with blue markings. 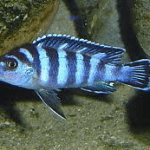 Breeding: Fairly typical mouthbrooding mbuna. Males are quite aggressive and this can lead to real problems with breeding. Make sure to have several females and a single male. 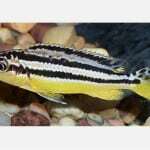 Additional Information: Like all Melanochromis species, M. johannii has horizontally striped males and females of different colors. 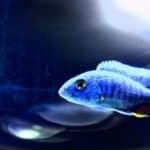 Males are a variable bluish black with pale blue or royal blue stripes. 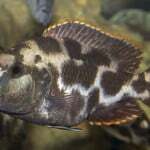 The dramatically different females are orange or yellow-orange with indistinct blackish stripes. 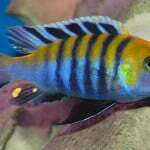 M. johannii is currently one of the more widely available mbuna species, at least in the USA. 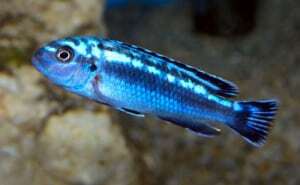 Unfortunately, like most members of the genus Melanochromis, this one has aggressive, territorial males which require a large aquarium with plenty of rockwork or other hiding places. If not provided with such quarters, the dominant male may pursue and kill any subdominant males and perhaps females that are not ready to spawn. 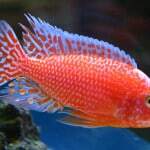 Thus, this is emphatically not a fish for the novice cichlid keeper, even though it is beautiful and widely available.